• Direct/indirect distribution of soft light creates superior brightness control and balanced light. 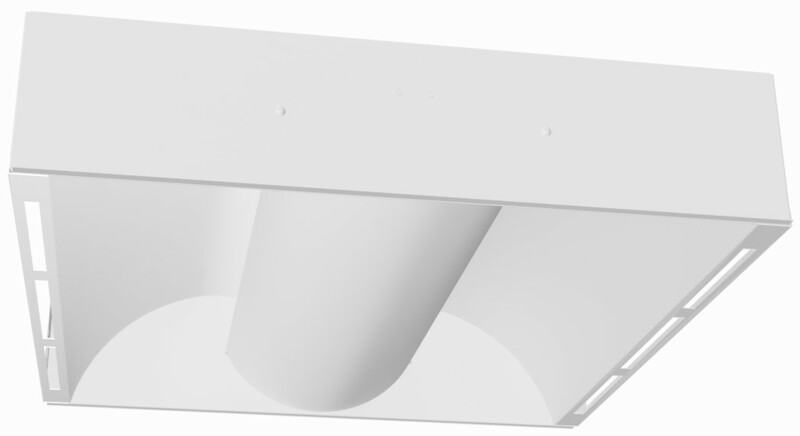 • Excellent for use where indirect lighting is desired, but ceiling heights are too low for suspended fixtures. • Hospitals and health care facilities to provide visual comfort for those people who look directly at the ceiling. • Die-formed steel housing and ends exceed code gauge. • Heavy duty ends securely fastened to the housing. • Side mounted T-bar clips. • Basket positioned below reflector to allow for indirect light. • Perforated white metal basket backed with acrylic diffuser to control glare and veiling reflections. • Shielding easily removed providing easy board access. • Quick access plate for convenient power connection. • Designed for Nema Type G (grid). • Consult factory for compatibility with other ceiling systems.